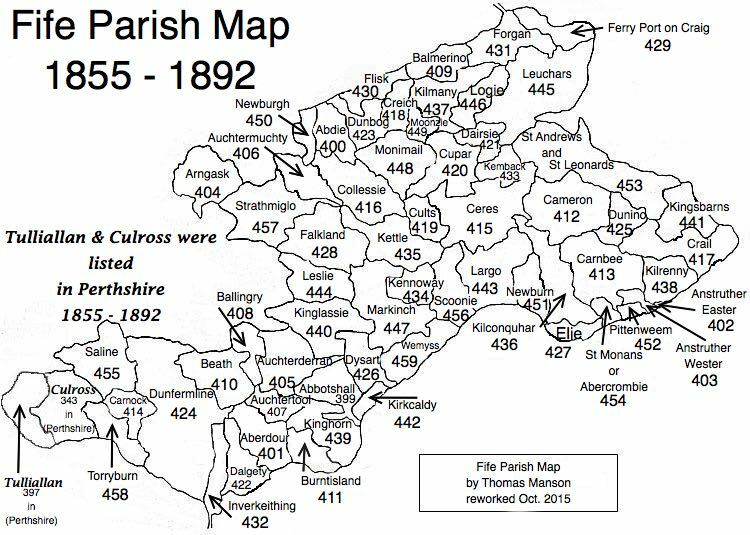 Parish of Anstruther-Easter – The Fife Post………..for genealogy and historical information. ANSTRUTHER EASTER, a burgh, sea-port, and parish, in the district of St. Andrew’s, county of Fife, 9 miles (S. S. E.) from St. Andrew’s, and 35½ (N. E. by N.) from Edinburgh. This place, which is of great antiquity, was, in the reign of Malcolm IV., the property of William de Candela, Lord of Anstruther. The church, built by subscription, in 1634, and to which a spire was added about ten years after, was repaired in 1834, and is well adapted for 700 persons. There are places of worship for Baptists, Independents, and members of the Free Church and the United Secession. Anstruther Easter was erected into a royal burgh by charter of James VI in 1583. The parish extends no farther than the limits of the burgh and has no landward district attached. It is bounded on the west by the parish of Anstruther Wester, from which it is divided by a rivulet and connected by a bridge. The town is situated at the bottom of a small bay with a harbour, and is well suited to the purposes of trade. In 1710 it was made a port and a custom-house was established. The revenue of the burgh arises chiefly from customs and shore or harbour dues, which have fallen off considerably since 1827. Like many other small towns, Anstruther Easter has of late years decreased much in wealth and importance. Though it is still the best market town in the district, its decayed condition may be judged of by the single fact that the tonnage belonging to the port, at the date of the former Statistical Account (1799), was 1400 and is now only 964 (with eleven vessels). As a result, part of the population cannot find employment here and old tenements have fallen into ruins. Formerly ship building was carried on here to a considerable extent, but for the last ten years it has entirely ceased. There is a tan-work in the town, also a brewery and a rope and sail work. About 600 barrels of cod are cured annually besides great quantities of herrings during February. These are exported chiefly to the West India market. Considerable quantities of haddocks are smoked for the home market. Seamen’s wages are about 2 pounds 10 shillings per month. A weekly corn (grain) market is held on Saturday. The number of shops is considerable, and there is a mill for the preparation of all hinds of meal. There is a post office in the town. This parish was founded in 1636 from Kilrenny. The first minister was settled in 1641 and the records of the kirk session have been carefully since then. The church, built in 1634 and renovated in 1834, is conveniently situated in a large burying ground surrounded by an excellent wall. The church is now one of the most elegant country churches anywhere to be seen and has seating for 630. There are three Dissenting meeting houses — for the Burghers, the Independents, and the Baptist. The families conncected with them, belonging to the parish, are in all about 33. The average number of baptisms during the last seven years is 16 and of marriages 10. No accurate record of deaths has been kept. There is only one school in the parish, the parochial or burgh school. The average number attending is about 80. The population has varied little through time. In 1744 it was 1000 and in 1831 it was 1007, but since then it has dropped. The number of families in the parish is 255. The above extract is from the account written in January 1837.